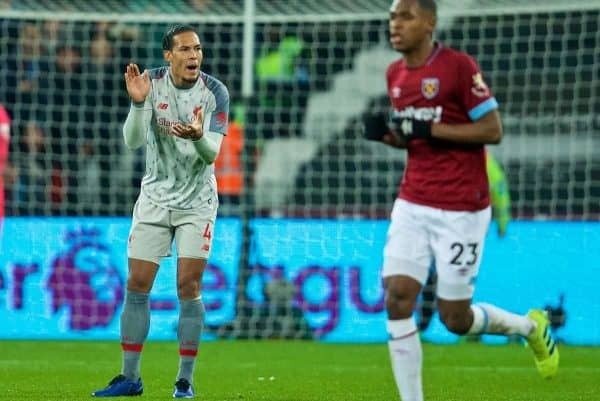 Liverpool were well off form as they drew 1-1 away to West Ham on Monday night, with few individuals coming away from the London Stadium with any credit. 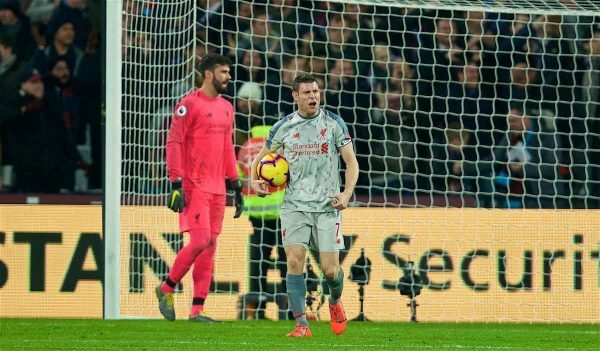 Alisson was looking to keep just his second cleansheet in his last six appearances, but that was erased when Michail Antonio levelled the scores in the first-half. The Brazilian was otherwise untested for much of the game, barring one good save from distance, but his distribution was a little shaky and he seems nervier of late. Liverpool’s Mr Versatile again reverted to right-back in the continued absence of Trent Alexander-Arnold and Joe Gomez. It was another real struggle defensively, though, as Felipe Anderson had the beating of him every time he had the ball. The veteran assisted Sadio Mane with a low cross, although the linesman somehow failed to notice he was a mile offside. Off the pace and clearly not comfortable in the position. Matip again showed that he just isn’t good enough to be starting for the Reds moving forward. Jurgen Klopp‘s side look so much more vulnerable with him in the team, with a timid style and poor positional sense causing issues. Wasteful on the ball, too, and generally infuriating to watch. Liverpool’s current front-runner for Player of the Year wasn’t as noticeable as he often is, but he was still a solid presence on the whole. Strong in the air and at least trying to hold a makeshift back-line together, the Dutchman did little wrong, although he wasn’t great on the ball – a trend in the team. 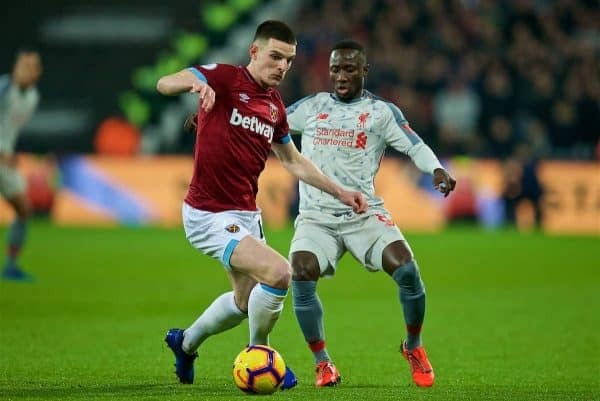 Robertson suffered a rare off night in the 1-1 draw with Leicester but he was better against a spirited West Ham team. His forays in the hosts’ half caused problems for Ryan Fredericks and Antonio and he was also reliable in his defensive work. Will play better, though, and he looked tired as the game progressed – which is concerning. Used in his stronger midfield role, the returning Brazilian was subdued for large spells, following such a positive run of form. He was either a little too safe in possession or off target with his long-range passes, and committed some sloppy fouls. Kept trying and showed authority, but more was required. Keita has suffered an increasingly underwhelming first season at Liverpool and this was in parts another poor showing, even though he grew in presence in the second-half. He looked off the pace at times, whether it be in terms of creativity, power and intelligence and his form is now a real issue – but crucially he was brave on the ball in terms of always taking the responsibility to dribble or pass forward. He really needs a goal to boost his confidence and find his best form. With Jordan Henderson and Gini Wijnaldum ruled out, Lallana started just his third Premier League game since January last year. 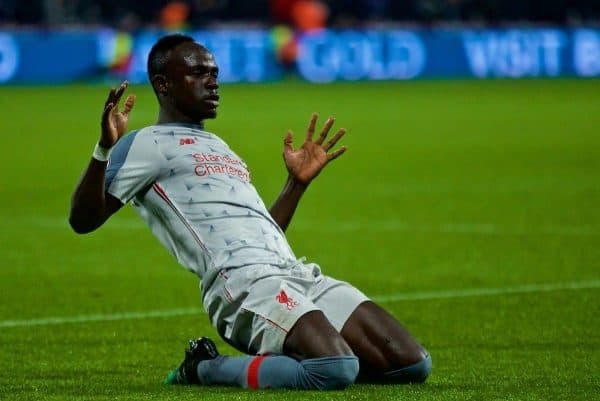 He was largely anonymous, with a lack of speed a big issue, although he did do excellently in the lead-up to Mane’s goal, showing good footwork. If the Ballon d’or was awarded for the most Cruyff turns in a year, Lallana would have won it for the last decade. That’s not a compliment, though! The Reds’ top scorer returned to a right-sided role in a 4-3-3 formation but he couldn’t have a major say on proceedings. West Ham defended against him well, in fairness, with his usual pace, movement and goal threat only on show very sporadically. Twice tested Lukasz Fabianski after the interval, but never felt like happening for him. Mane’s form has been consistent of late and he was Liverpool’s brightest attacking spark for the second match in succession. He fired home his 11th league goal of the season to put the Reds in front and he kept attempting to make things happen after the break. Not perfect by any means, but outshone his teammates. Pushed further up the pitch to lead the line like he did last season, albeit still dropping deep, Firmino was horrendous at the London Stadium. He hit the target early on when he should have done far better and he was guilty of losing the ball on endless occasions. Substituted in the second half, having endured one of his worst-ever showings for Liverpool. The change in system really affects him the most. Xherdan Shaqiri (on for Lallana, 69′) – 5 Tried, and failed, to make anything happen. Off form for a while now. Divock Origi (on for Firmino, 74′) – 5 Was direct in his running, but missed a great chance with the final kick of the game. Not really going to win you titles with him as your attacking sub. Subs not used: Mignolet, Camacho, Moreno, Jones, Sturridge. It’s been two frustrating nights at the office in a row for Klopp and the Reds. 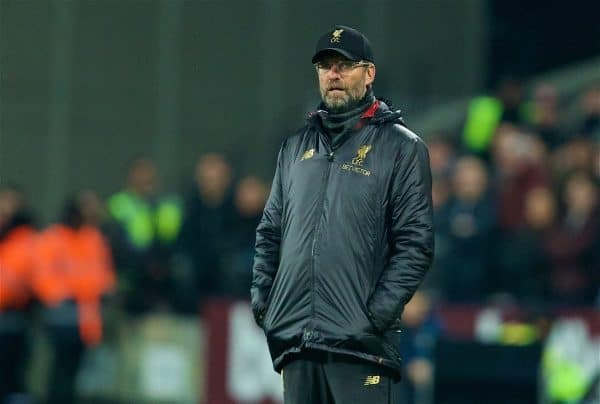 Quite what has happened since the trip to Dubai remains to be seen, but Liverpool look a completely different side for all the wrong reasons. In fairness to Klopp, injuries have hit his side hard, but he struggled to get even an adequate performance out of his team. Worrying times, yet the Reds are three points clear at the top of the Premier League. Interesting that Origi is now ahead of Daniel Sturridge from the bench.